We are normal, everyday hard-working people with a common hobby, blogging. We hail from far and wide. We reside in different lands, on different continents. We speak different languages, eat different foods, and are of varying ages, professions, and religious and cultural backgrounds. We believe that terrorist attacks, wherever they may be perpetrated; whether in France, Tunisia, Canada, Iraq, or in Denmark, Turkey, UK, Algeria, Yemen, USA, Lebanon, or in the skies over Egypt, or in India, Saudi Arabia, Australia, Afghanistan, Nigeria, Kuwait, Libya, Bangladesh, Syria, or Mali are nothing less than attacks on humanity itself. The list is long, and probably many more besides. In every place, in every country, we, as a community of human beings, are always the innocent victims. However, we, as members of this humanity, have found we have much more, not less, in common than those who seek to polarise our global community through indiscriminate murder of our fellow brothers and sisters. We will not be separated or forced to cease our friendships. We will not change our ways – we are happy as we are. We are all different, and proudly so, and stand together as one. We respect each other’s right to life. ALWAYS with LIGHT and LOVE to ALL my ANGELS and BEYOND! Reblogged this on Edwina's Episodes. We can achieve peace, one person at a time. You can add my blog to your list, Memee’s Musings. I also posted on this topic just two hours. I have added your hashtag to my post. Beautifully said. I will reblog this on my Buthidars site but you also have the full support of My Barsetshire Diary site as well. There are more of us than I sometimes realise. I’d feel honored to be part of such a group, statement, and vision. Wrongful death is, well, wrong. And we hear too much about it lately, which means there’s how much more happening we do not know about. Building peace is the better form of construction we can do. Uniting for peace is a right first step to take. I’m a relatively new blogger, but I think this is a wonderful purpose to serve through the medium. Thank you! Sorry, meant to say I found this post through The Buthidars blog. Peace. Yes. Yes, we do. Count me in. Reblogged this on Elusive Trope. Yes, please, add me to the list of signers. Thank you for such a bold, beautiful blog. Peace out. I’ve reblogged this. Please add me to the list of signatures. Thank you. Amen. It is time to stand up. Amen – I’m with you there! Beautifully said!You can definitely add my signature to the list. A BEAUTIFUL AND TIMELY MESSAGE INDEED. Feel free to add my name to that list. Thank you! Please add me to your list of signers. Der 2. Advent ist ein guter Tag um des Friedens zu gedenken…und um sich gegen einen Krieg für den Frieden immer neu zu entscheiden…im Großen, wie im Kleinen. 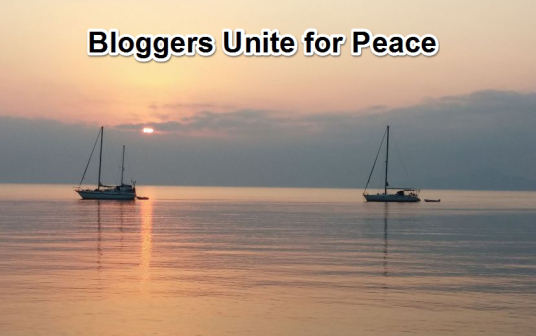 Eine sehr schöne Initiative, die ich gerade in unserer Bloggerwelt gefunden habe spricht mir hier aus dem Herzen: BLOGGERS UNITE FOR PEACE! The 2. Advent is a good day to commemorate the peace … and to decide always new against a war for peace … in the big, and small , A very nice initiative that I just found in our blogger world speaks to me here from the heart: BLOGGERS UNITE FOR PEACE! I’d be honoured to have either of my blogs addedd to your list. The Buthidars is where I reblogged it or My Barsetshire Diary blog. Many thanks for now following my blog.